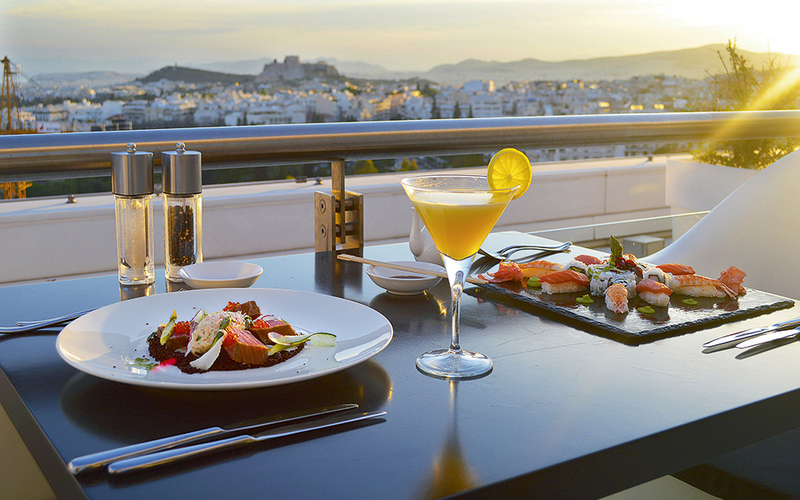 The largest swimming pool and the most impressive rooftop restaurant and bar in Athens combine to give you that getaway feeling on a hot summer day. Not yet 7 am and I’m already beginning to feel the heat of the day slowly swirling its way into my life as it dances around me, announcing that it’s here to stay. But that’s alright. I know exactly what to do. I dig out a couple of swimsuits, my favorite sarong and sandals, sunglasses and a pretty outfit that I can adapt from daywear into nightwear by adding a few key accessories to give it that touch of glamor. I have an all-day plan, and it doesn’t involve boat tickets, tedious lines or lengthy journeys of any kind. It begins as I step out of the elevator and approach the Hilton Athens swimming pool, passing by the Oasis Bar and Grill, thankfully open from 8am. I select the perfect chaise longue, where I intend to lavishly lounge the hot hours away, sipping an icy coffee or an invigorating fruit and vegetable smoothie. 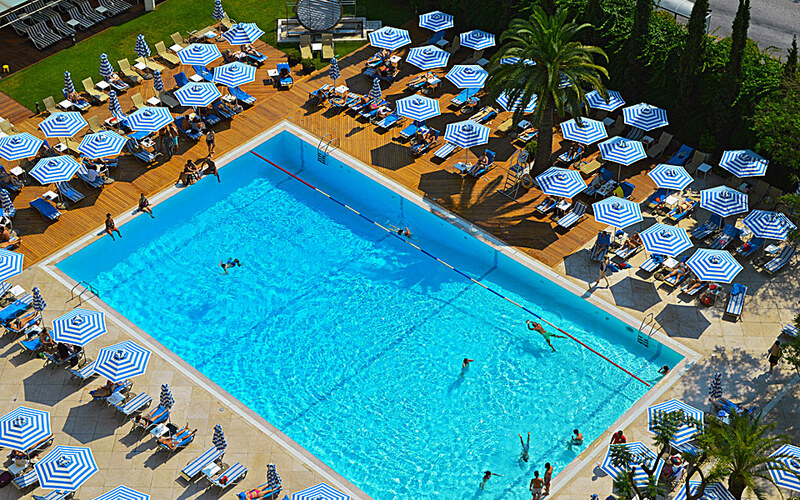 I love that I am right in the center of Athens, yet I can relish the tranquility, coolness and polished allure of this welcome urban destination, which comes complete with the largest and deepest outdoor pool in the city (25m x 15m). When I get peckish, I’ll probably order my favorite Oasis salad of goat’s cheese, rocket leaves, mango, lettuce and tongue-tingling strawberry vinaigrette, although I’m always open to suggestions from executive chef Kostas Athanasiou, whose menu has often tempted me with its delectable pizza margherita or that classic poolside snack, the club sandwich – a simple dish that, nonetheless, when done right attests to any chef’s true culinary skills. The Oasis Bar and Grill is ideal for a bite to eat. 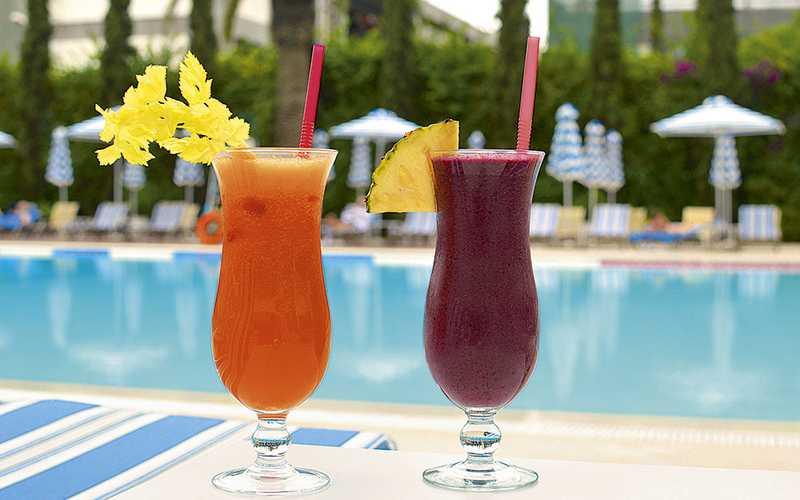 Freshly prepared smoothies can be enjoyed by the pool. If you feel like pampering yourself even further, indulge in a sweet treat. 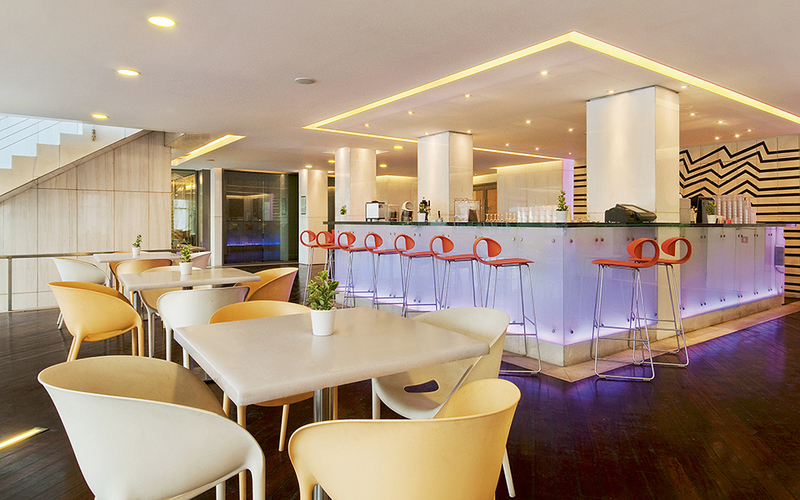 At the end of your day, unwind with a cocktail at the Hilton's famous Galaxy Bar. The friendly staff, the laid-back yet polished décor, and the quietly elegant ambience will keep me there until I’m finally sure it’s time to shower and change back into my clothes, reluctantly leaving my happy pool-bunny existence behind. Usually, this is just the moment when I spot one or more of my friends as they arrive, coming to join me in the midst of my Hilton escape quest. We tend to start our time together by settling ourselves in at the Galaxy Bar & Restaurant on the Hilton’s iconic roof garden. From there, we can worship the stunning view of the Acropolis and Lycabettus Hill graced with an unbelievable sunset backdrop bursting with violet, saffron, gold, blue and neon-pink hues. The feeling of bliss is enhanced by the fact that, by now, our fingers are dancing with anticipation on a frosty glass of perfectly chilled, crisp wine – or, if I’m really celebrating self-indulgence day, I might order the zingy and uniquely flavored Honeymoon cocktail, with ginger and rhubarb. Either drink is the perfect accompaniment for what starts coming our way as the sky turns into a glittering blue-black canvas – our carefully placed order of mouthwatering starters, such as tuna tartar with a refreshing melon and pea soup (a palate-party of summer flavors), followed by a traditional wild greens pie with xinomizithra cheese from Naxos island. Other personal favorites include the octopus carpaccio or the excellent variety of fresh and flavorsome sushi rolls. 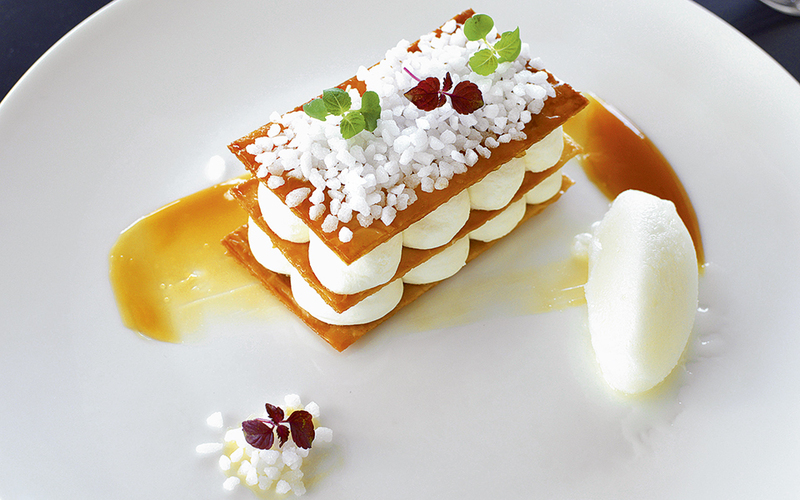 And no matter what the main course, there’s always space for a sweet ending to a day like this – for me, it comes in the form of either the coconut mille-feuille with salted caramel sauce, or the pretty Valrhona chocolate cylinder with kumquat sauce. At home, I smile all the way to my bed, thinking about how special my day has been.